This attractive park located in Dublin city centre was designed by Dáithí Hanly and dedicated to the memory of all who gave their lives in the cause of Irish Freedom. 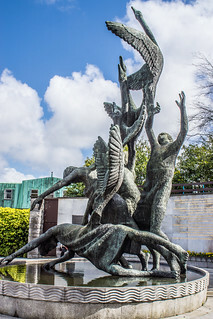 The large sculpture by Oisín Kelly is based on the theme of the "Children of Lir". The site of the Garden is where where several leaders of the 1916 Rising were held overnight before being taken to Kilmainham Gaol.